As you may have guessed from my 32 week photo outfit, we've been working on the kitchen renovation. 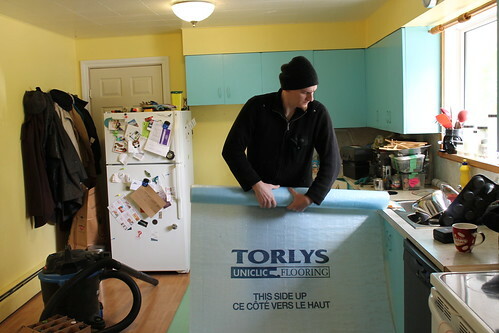 We started by taking out the floating floor, which came out really easy. We were a little worried about what we'd find underneath, but we were pleasantly surprised by the condition of the plywood subfloor. 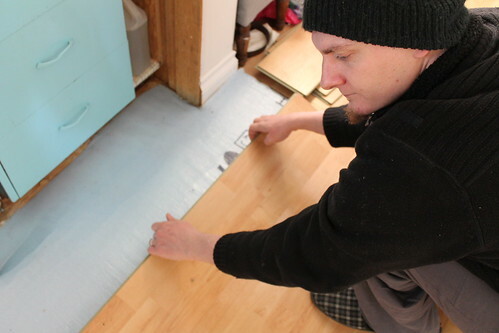 After the laminate flooring was safely stored in the basement, we tore out the kitchen closet. Unfortunately removing the cabinets was not as easy as the floor and closet. 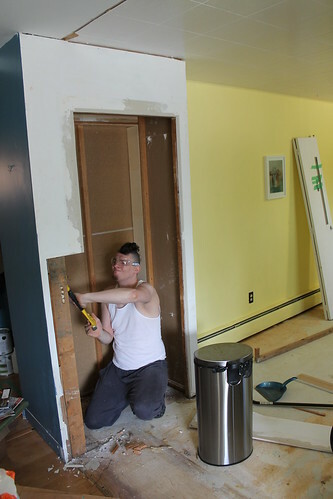 I had originally hoped that we would be able to keep the cabinets to reuse in the basement or garage, but they were built in place with an excessive amount of glue and nails, so taking them down required tearing them apart. 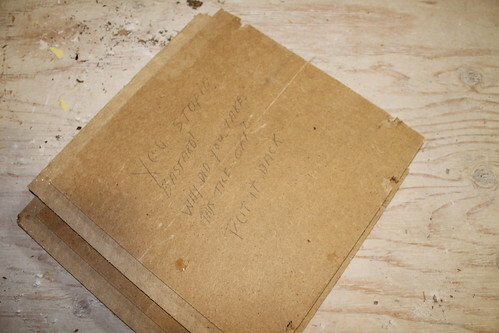 At least we should be able to reuse some of the wood from the cabinets. 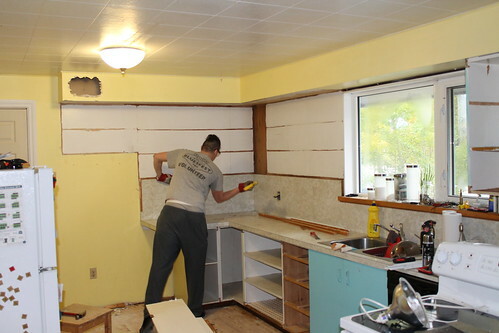 After pulling out the cabinets, we discovered that we'd need to do more work on the walls than we'd originally expected. 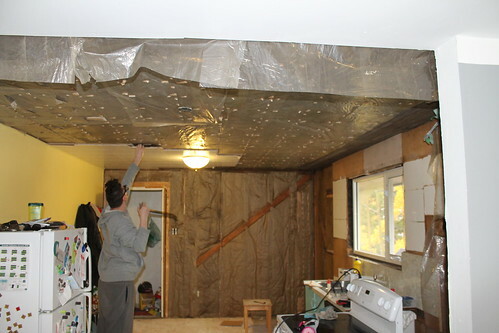 We removed the thin wood sheets, so we can put up a vapor barrier and gypsum board. 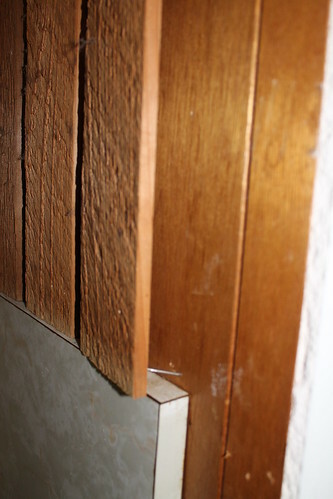 behind the wood paneling, more wood paneling! 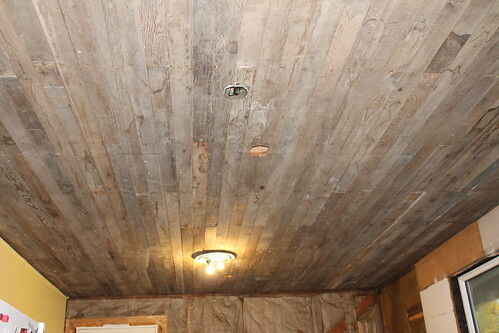 The next thing to go was the ceiling tiles.The naked wood ceiling actually looks really cool and Chris and I are both a little disappointed that we're going to have to cover it up. But we can't have sawdust and insulation falling into our food while we're cooking in the kitchen. Hahaha... the message on the back of that tile is too funny. Looks great guys, keep up the good work!